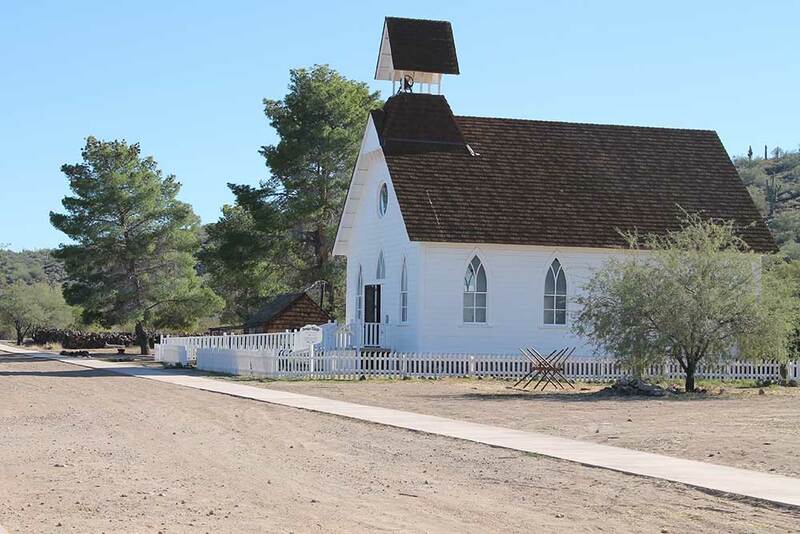 This church is a copy of the St. Paul’s Methodist Episcopal Church which stood in Globe, Arizona, from 1880 through 1927. 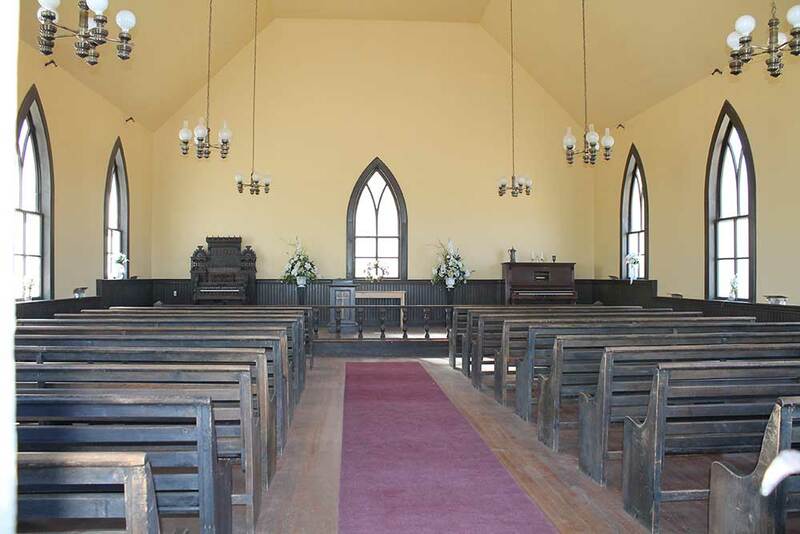 The church’s painstaking and authentic reconstruction was based upon church records, original photos, newspaper clippings, personal interviews, and over 1500 hours of research. 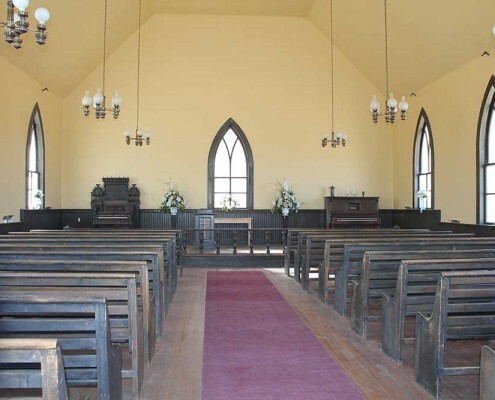 Now referred to as our Community Church, it is used for Sunday worship and is available for weddings throughout the year. Funds to construct the church were donated by Mr. and Mrs. A. P. Tell and family through the Tell Foundation. Mr. Tell was a Phoenix industrial developer. 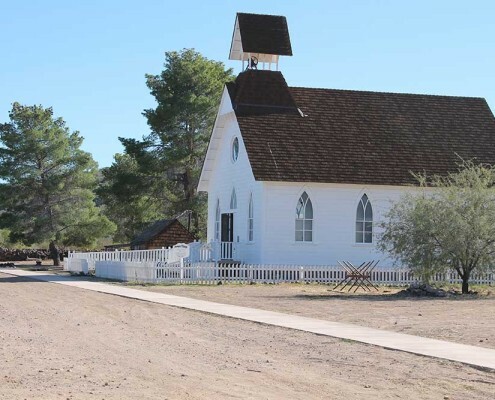 Two of the original pews were donated to Pioneer Arizona by the First Baptist Church of Globe and copied to provide the seating now available. The original church was torn down and the property sold to Mountain States Telephone Company after a farewell service held on Sunday, September 11, 1927. The original church bell, dubbed “ God’s Alarm Clock” by the residents of Globe, now graces the rebuilt St. Paul’s Methodist Church in Globe. The bell at Pioneer Arizona is a replica. Globe is still a mining town, elevation 4,500 feet. In the early 1880’s Globe boasted 2 churches, 1 school, 1 bank, 2 drug stores, 2 hotels, several restaurants and lodging houses, blacksmith shop, saloons, and about 10 mercantile houses.